Blue Nile diamond and jewellery consultants are conveniently available to help you, whether you have a question about your ring or your order. And you won't have to wait on hold, as most calls are answered in less than 10 seconds. They offer guidance based on the standards set by the world's foremost diamond grading laboratories. Our diamond and jewellery consultants are not only experts on the 4Cs, they've also helped thousands of couples choose the perfect diamond. Seven days a week, our diamond and jewellery consultants are available to help you with difficult decisions ranging from diamond shape or setting style, to choosing between platinum or 18k gold. 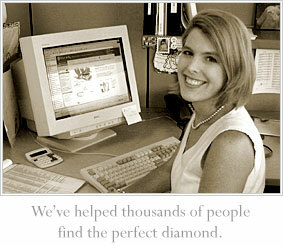 They are experts at helping people select an engagement ring she will love. You can set the pace and there is no pressure to buy because Blue Nile diamond and jewellery consultants do not work on commission. At Blue Nile, your ring is set by master jewellers with decades of experience creating fine diamond jewellery. Here the specific diamond you selected is located in our stock of thousands of diamonds. We also find your setting, size it to fit your fiancée's finger, and add prongs that are perfectly sized to fit your diamond. Next, both your diamond and setting enter the jeweller's workshop to be set. Working under magnification for precise detail work, your diamond is carefully set by one of our expert jewellers. Careful steps are taken to ensure that your ring is set to maximise beauty and security. Each Blue Nile jeweller has an average of 22 years of experience creating quality rings, so you know your ring will be crafted with attention to every detail. 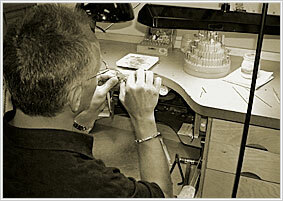 In the jeweller's workshop, they use only the finest equipment to set your ring with the utmost quality. 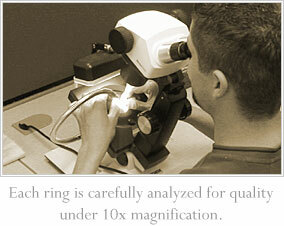 In the process of being set, your ring will go through a 3-step quality assurance test. This ensures that the most important piece of jewellery of your lifetime is of the absolute finest quality. All settings are inspected for quality, and those with sidestones are carefully inspected under magnification to ensure the gemstones meet the Blue Nile standards of quality. Once your diamond and setting pass quality assurance tests, they go to the jeweller to be set. Before the jeweller considers setting your diamond, he inspects it once again to assure the utmost quality. Once the jeweller sets your diamond with the strength and security of platinum prongs, your finished ring returns to the quality assurance department where it is inspected a final time, as a whole. Here the ring is carefully reviewed, appraised, and an appraisal document is created. We insure your shipment all the way to your doorstep. Your ring will be shipped via insured, secure carrier, and your box will be unmarked to continue to keep its contents secret. If at any time you would like to know where your ring is, feel free to contact a Blue Nile Diamond & Jewellery Consultant at 00800-2583-6453 from France, 0800 098 8541 from the United Kingdom, or 00353 1 899 1351 for all other EU countries.